The Bâtiment de Transport Léger (abbreviated BATRAL; "Light ferry ship") are small landing ships of the French Navy. Also known as Champlain-class by the lead ship, they have been used for regional transport and patrol needs in French Overseas Departments and Territories since the 1970s. On 9 January 2014 it was announced that the two remaining Batrals in French service would be replaced in 2015/16 by three 1500-tonne Bâtiments Multimission (B2M) at a cost of ~€100m (US$136m). The Batrals can ferry over 400 tons of matériel, in the hangar and on the deck. Loading and unloading can be done from a harbour or on a beach. Two flat-bottom vessels allow unloading fifty men and light vehicles each. The accommodations are designed for a Guépard-type intervention unit (five officers, fifteen petty officers and 118 men), or for typical company-sized armoured units. A helicopter landing deck allows landing for light helicopters, and transfer to and from heavy helicopters. 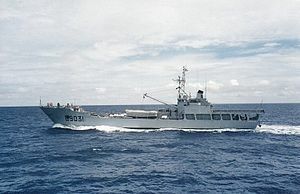 The Chilean Navy purchased the plans and built three ships in the ASMAR shipyards in the early 1980s. ^ a b c Pape, Alex (9 January 2014). "France orders three new multimission vessels". IHS Jane's Defence Weekly. ^ "Le Batral Jacques Cartier est rentré en France" [The landing ship Jacques Cartier returned to France]. Marine Nationale (in French). Ministère de la Défense. 15 July 2013. Wikimedia Commons has media related to BATRAL. This page was last edited on 18 February 2019, at 23:10 (UTC).